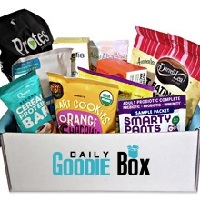 Sign up with Daily Goodie Box and they will send you a box of free goodies both full size and samples! Shipping is Free. and they’ll never ask you for a credit card! This Month they have Over 480 Ready to Ship! **UPDATE head on over to their Facebook Page, they give away boxes to those that leave comments on a few giveaway posts per week. Some posts they give away over 100! You must be registered already to qualify.